Over time, I’m learning never to say never and never to say always—when it comes to some of the knotty problems which we of the 1967 Beetle Community confront. Oh, yes—a lot of the time there WILL be an explanation for what appears to be a radical problem. But—what about those other situations which seemingly have no quick answers? Hummmmm! “Hi Eric, It’s been a while since I’ve asked you about some ‘67 trivia. I’ve recently acquired an American spec Right Hand Drive (RHD) ‘67 Beetle. Unusual? It seems so… Very cool story about its travels. I’ll get into that later. But first, I wanted to ask about the ‘67 Rear View Mirror. I know that some ‘67 Rear Views had their stems painted black and the mirror head had a black plastic backing. Was this for the entire run of ‘67 VINs? Or (let’s say) did early ‘67s come with the chrome-stem/aluminum-head Rear View? Finally… is the black/black Rear View Mirror ‘67 only, or did that style continue into 1968? During the brief research I’ve done, I’ve been told that there were a few select RHD markets that had the option of either Euro or American Spec ‘67s. Thailand and possibly Japan being just two that were named. I have no idea how to confirm this….but it makes for fun head-scratching moments. 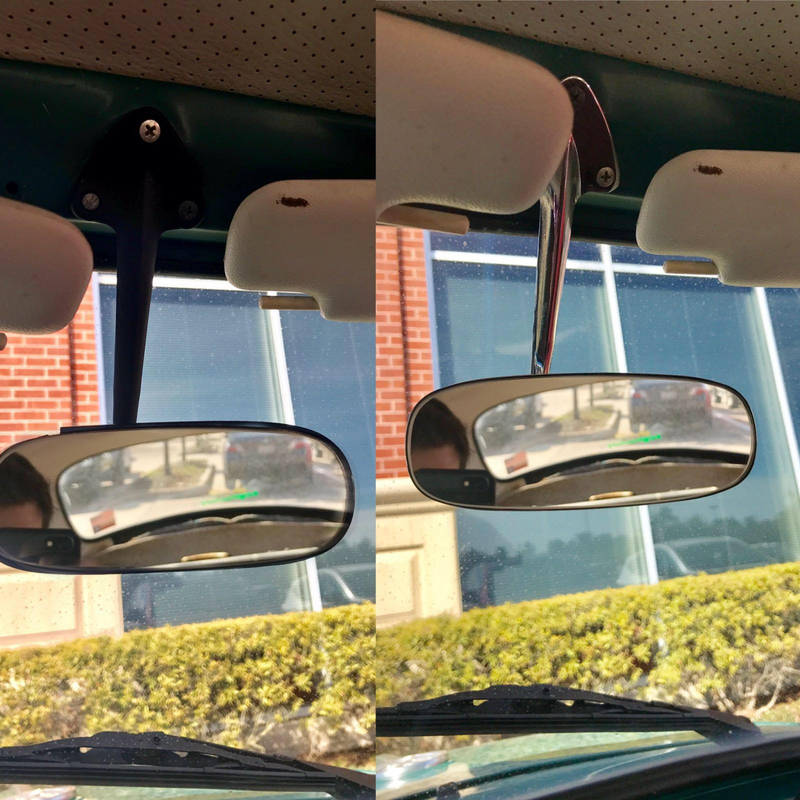 Eric commented that his ’67 Beetle has the black-stemmed Mirror with the black plastic back, and further explained that it was his understanding that the car came from the factory with the present Mirror. Eric provided a photo of his car’s Mirror. Then, he produced a comparative photo of the chromed (bright) version and the black/black version of Mirrors. No denying the fact that there were–and are–black/black Mirrors! You know, you see your own car day-after-day and you begin to believe that YOUR car is the only one out there which exhibits the Wolfsburg stamp of approval. I looked again at Todd Van Winkle’s 1967 Standard Beetle Article. Sure enough, Todd makes a point of noting his black/black Rear View Mirror! Furthermore, Justin sent a photo of the black/black Mirror which he purchased through eBay UK. Knowing, now, the basic history of Justin’s car (not destined for consumption in the USA from the Factory), plus the facts about Todd’s Standard Beetle, I began to think that perhaps the black/black Mirror was specific to Standard Beetles, and for versions of the ’67 Bug destined for markets other than for the USA. Based upon these “factoids”, I thought, perhaps, the black/black Mirrors were created for those other markets and ultimately became a Dealer replacement Mirror. There was the nagging thought about that plastic backing of the black/black Mirror. 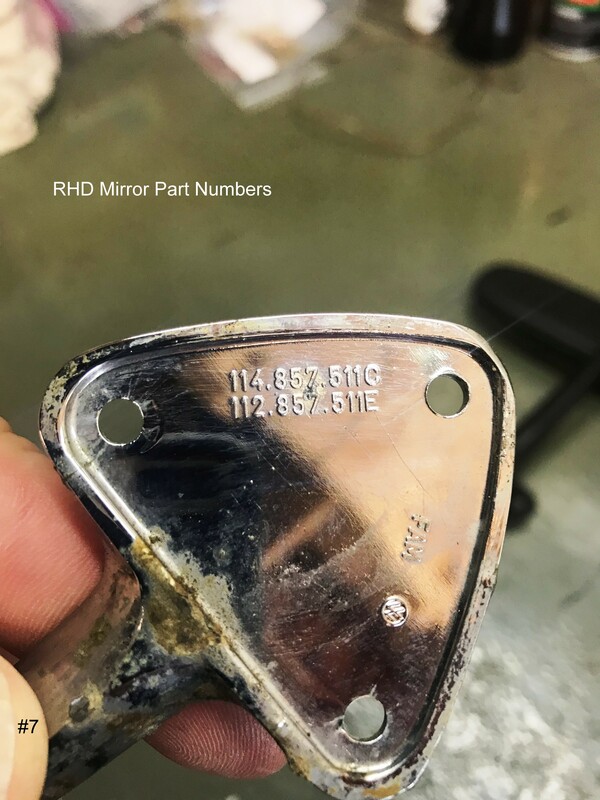 From the photo which Justin sent of the Mirror which he purchased from eBay, the backing strongly resembled the backing for the ’68 and later Beetle Rear View Mirrors! Why would VWaG come out with a Mirror with a plastic backing when it already had the bright Mirror in use for years 1965-1967? What would any of this have to do with RHD ‘67s? I called David Brown of Pennsylvania. You’ll recall that David only recently retired from the active VW Scene but VW still runs hot in his blood! I put David to thinking on the subject. He told me that, indeed, he has seen the black/black Mirrors but had not put much thought into the “why” of them. He opined that perhaps the Mirrors were from the Mexico or Brazil plants and came to be used as replacement Mirrors for ’65-’67 Beetles. I let all of this ferment. Then, I decided to dig a bit—I have boxes of parts sitting which I rarely open. I dug through my Mirror boxes and what to my wondering eye should appear, but a black/black Mirror! I cleaned it as best I could. Then I pulled a good representative bright Mirror from the pile. I examined and compared the VW Part Numbers. All of my bright Mirrors were: 113-857-511C. Both examples show the VW Logo. But, the Manufacturers’ Logos are different. The bright Mirror sports a manufacturer’s Logo of a U within a carat. The black/black Mirror sports a raised rectangle in which is a circle around the Logo reading “hohe”. “Hello JK , It was good to talk to you about the Mirrors, got the part numbers flowing again, lol. I was able to find some references to interior Mirrors in those New and Replacement Parts listings that I mentioned to you. Supplement 11/68 to the Type 1 Parts Book lists 113-857-511C as being superseded by 111-857-511P ! Other than remaining Dealer stocks, this would be the replacement Mirror for ‘65-‘67 Sedans and is what is called for in my VW Parts Book of that (‘68-‘70) era. By this I would guess that the Standard Standard should have a normal chrome stem with aluminum case as should all 1967s. I thought, based on the limited information which has surfaced, that Beetles from 1965 through 1967 left the Wolfsburg Factory with the bright Mirrors (113-857-511C). 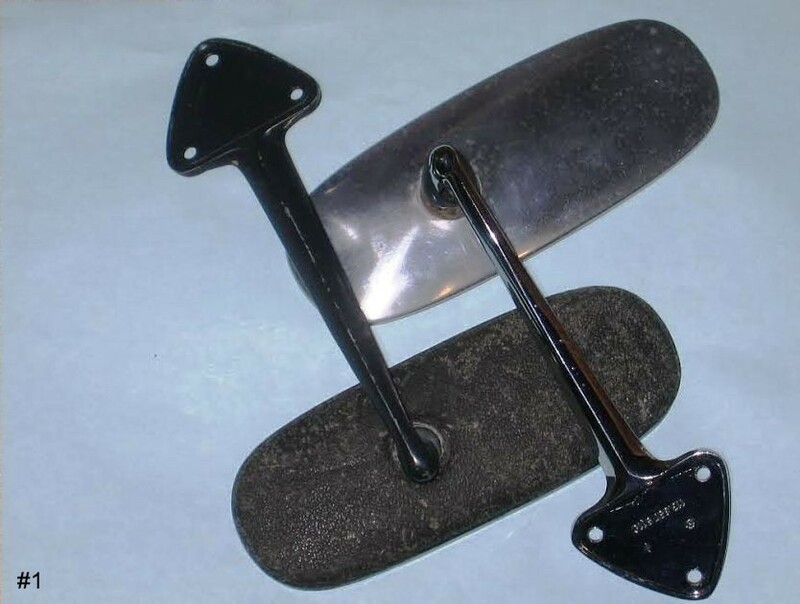 Then…Volkswagen authorized replacement Mirrors (for ’65-’67 Beetles) from 1968 onward were black/black Mirrors. I knew that this suggested conclusion was going to spark some discussion. If it did, I hoped that we could learn more about the elusive black/black Mirror. Subsequent to having written all of the above…..nagging questions remained. I tried flipping all of the 113-857-511C bright) mirrors which I have. Yes—it seemed that by rotating the mirror so that the long part pointed the opposite direction, the bright mirrors could be used for either Left Hand Drive (LHD) or Right Hand Drive (RHD). To test this, I sat in the passenger’s seat of my personal 1967 Beetle. I rotated the Mirror. No matter how much I adjusted, I could not see the complete rear windshield without craning my head to the left. This is counter productive, of course, because at that point, a person sees his own face! Therefore—I theorized that there must be bright Mirrors specific to the LHD and to the RHD Beetles. On the other hand, the black/black Mirror, which I had at hand, has a different socket which allows the mirror to be rotated and aimed so that it can be used with either LHD OR RHD. I sat on this Article, and it was a good thing. Shortly, I received further information from both Justin Heath and David Brown. Black/Black Mirror: 111-857-511P The stem socket DOES allow for full range of motion to suit either RHD or LHD cars when the Mirror Head is spun 180 degrees accordingly. Bright Mirror: (has two part numbers) 114-857-511C / 112-857-511E When the bright Mirror Head is spun 180 degrees, it DOES NOT allow a range of motion to see out of the rear window from a LHD driver’s perspective. However, it does have proper full range of motion from a RHD driver’s perspective. Some lube in the stem socket freed it up from being stuck (as I received it) and allowed it its full possible range of motion. 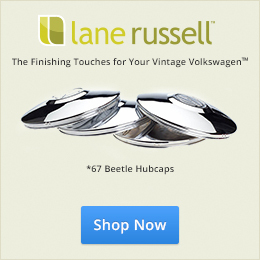 Presumably the 113-857-511C bright Mirror was the factory Mirror for all LHD 1967 Beetles. Presumably the 112-857-511E /114-857-511C bright Mirror was the factory Mirror for both RHD Standard and RHD Deluxe Beetles. 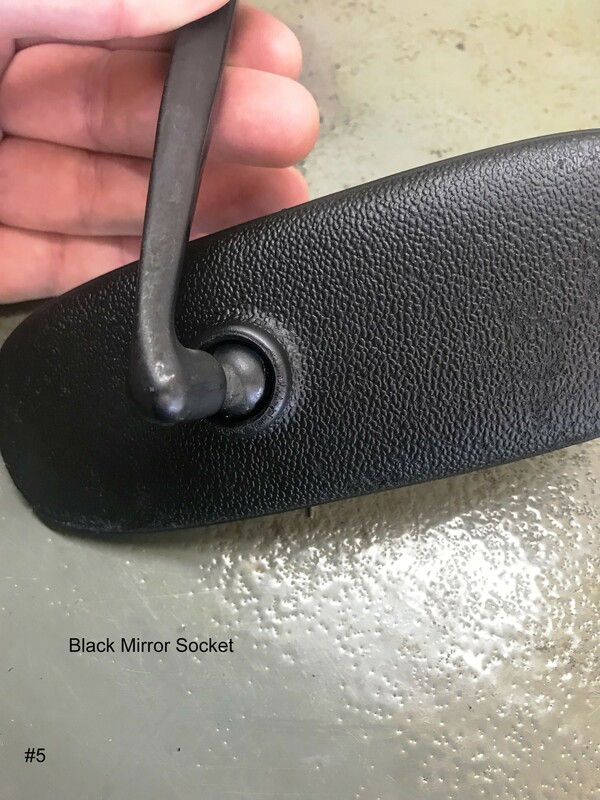 Presumably, the black/black Mirror was a replacement Mirror issued which could replace either LHD or RHD Mirrors for 1965-1967 Beetles regardless of their country of destination. 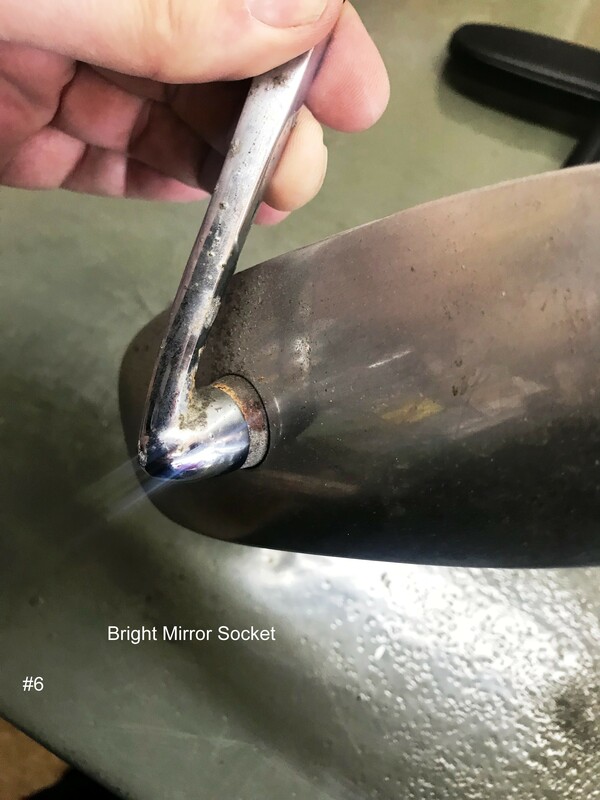 As we hear from more 1967 Beetle Owners, hopefully we will be able to add to this Analysis and to understand more fully the styles of Mirrors used for 1967 Beetles. I want to thank Justin Heath for permission to use his name, his discussions and his photos. David Brown’s input always is appreciated. Thankfully he has conserved “ancient” Volkswagen documentation. My wife, Neva, patiently photographed until I was satisfied. JK does it again, folks! We had been going back and forth on this mystery. Kudos to Neva and everyone involved to help bring this story to life. Go, ’67 Beetle community! I never had a 67. I own a 70. The more I read on your site, the more it seems like 67’s used a lot of different suppliers and seem to be cars that were built using parts sitting in the factory. My real question is not about he differences in the 67, but why? Had a 67 in 1971. Completely original US spec CA car. Mirror all chrome aluminum. No black. Hello, Clyde—Long time no hear from you! While I sometimes find myself struggling with a problem, it is rewarding when Readers and others are willing to step in with experiences and information–often themselves doing a lot of research towards the solution. That’s when I know that this is a Community Effort–not just a personal journey! Sometimes I have to jump out of my office chair and shout about it! I have a ’67 built in Germany and imported into the US and I have a chrome rear view. I’ve got the black mirror, only because my 67′ is the Standard model, VW didn’t use much chrome on those bugs! I like it, just because its different! Hi Jay, thank you so much! Actually when I saw that 67′ the mirror was the very first thing I noticed, I knew it was a strange bug!! And I wanted it!! Enjoy your 67′ as well my friend! Thank you, Jay. 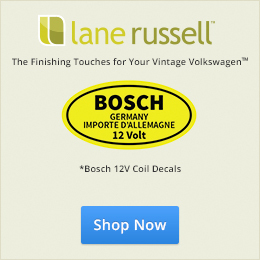 I follow this 1967 VW site from Wolfsburg, Germany and have for years. We respect your knowledge of the year ’67. Forgive me, english isn’t that good. Thanks again Jay!! I do take it to a few shows, they like it! I think most people think its just a regular beetle, not the cool Standard it truly is! Let me say how impressed I am with your vast knowledge and wonderful articles, I have learned so much from you! Keep it up! Jay, You are being TOO modest. You know SO much.Enjoyed the mirror article so much. SO much to learn. Our 67 LHD was delivered to a VW Dealer in Fort Collins Co. We are the 4th owner and it sports a chrome mirror. Here’s my mirror info. I bought my ’67 in ’78. It was built in 8/66 if I remember correct. It originally had a “bright” mirror. I replaced it with the black mirror that I purchased from Renfree VW. I can’t remember if the original mirror was damaged or if I just preferred the black since my ’67 was a Cal-Look. The black mirror is still in the car today. Renfree VW was on Katella Ave. in Orange, CA. Yes my car is a US Spec LHD. my norwegian 67 has the black mirror.